Trophy Eyes may have only just wrapped up their wildly successful and very sold out Australian tour last week, but they are keen to do it all again in August. Kicking off in Perth, Trophy Eyes will do another victory lap of the country with support from The Hard Aches, Trashboat (UK) and Rumours. Currently on tour with Moose Blood stateside, Trophy Eyes have had an epic five months since they released their acclaimed new album Chemical Miracle, which debuted at #8 on the ARIA Album Chart and has been lauded for its raw emotion, depth of introspection and courage. Trophy Eyes backed it up with a chill-inducing set at UNIFY 2017, and much to the dismay of the triple j text line, the boys from Newcastle missed out on a place on the Hottest 100 by a whisker, landing #101 with their heart-wrenching anthem Chlorine. This culminated in their biggest Australian headline tour to date, which saw sold out signs on each and every box office around the country. The demand for Trophy Eyes was so strong that half the tour sold out two months in advance. 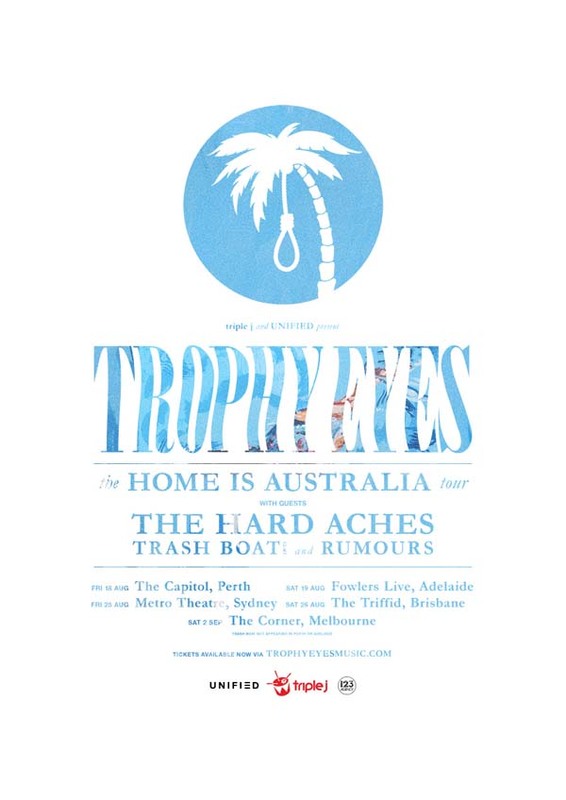 Supporting Trophy Eyes around the nation will be The Hard Aches from Adelaide. Their brand of slacker indie punk is driven by introspective, powerful lyricism that cast a spotlight on depression, anxiety, lost and the real hunger for redemption thought support and community. The stage - whether that be a laundromat, lounge room, festival or theatre - is where The Hard Aches really shine and they've recently shared it with Luca Brasi, Tired Lion and The Front Bottoms. The Hard Aches will take time out from writing their anticipated second album to play at The Hills Are Alive before joining Trophy Eyes for the tour. Trash Boat, hailing all the way from the UK, will make their maiden voyage to Australia this August hot off the back of their 2016 debut album, Nothing I Write You Can Change What You've Been Through. The album was produced by The Wonder Years frontman Dan "Soupy" Campbell (his first time in the producer's chair), and the band are currently on the road with New Found Glory and will hit up Download Festival before setting sail down under.